Now this is my kind of late summer breakfast. You know the time of year – when all the markets are full of fuzzy peaches and dark purple plums. The kind of fruit that was picked ripe because it was grown locally. The kind of ripeness you can smell half an aisle away. This fruit doesn’t need to be simmered or have sugar added. It’s perfect just the way it is. So besides eating it over the kitchen sink, juice dripping from my hands, I try to keep my preparations pretty simple. 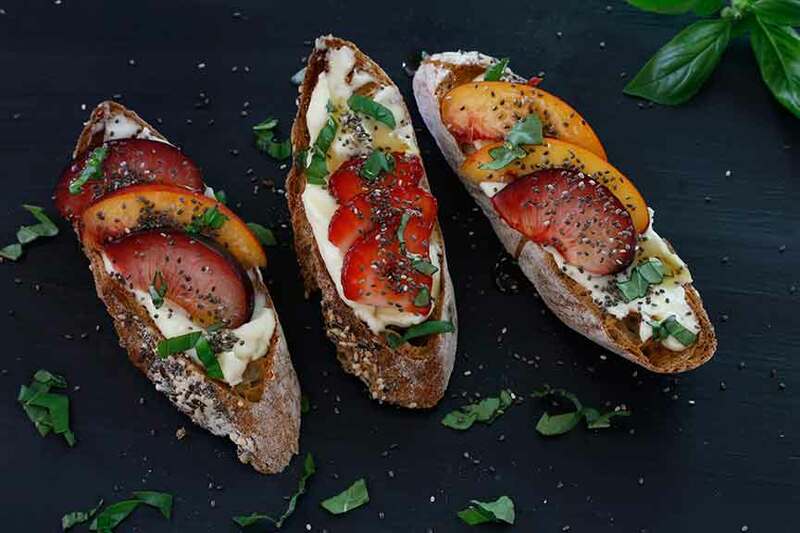 Like this Toast with Lemon Ricotta and Fruit. I made the lemon ricotta from scratch but it doesn’t have to be that complicated. Mix commercial ricotta with lemon zest and a little fresh juice. Add a touch of cream and mix in a food processor until it takes on the consistency of cream cheese if you’d like, although certainly not necessary. Toast thick slices of crusty French bread. I like the ones with lots of seeds baked into the crust. 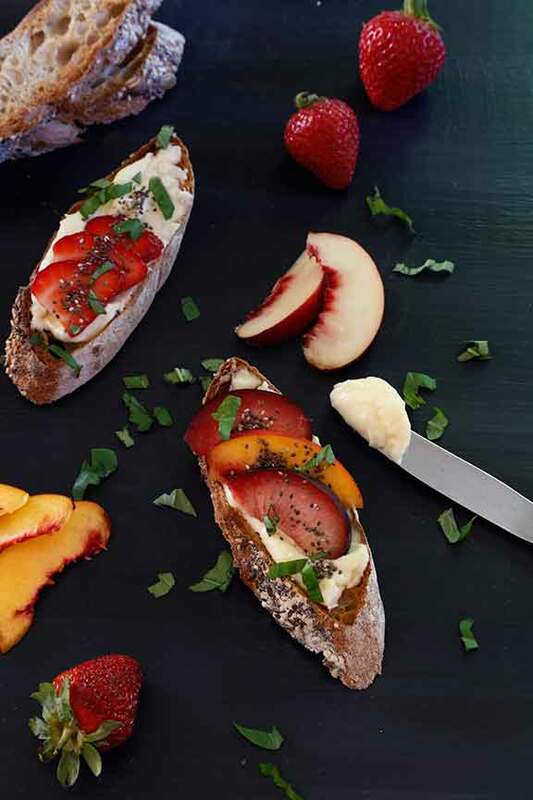 Spread with the lemon ricotta and top with slices of peaches, nectarines, strawberries, plums or whatever your favorites might be. Maybe add a sprinkling of chia seeds or chopped basil. Or both. Maybe a drizzle of honey. Grab a cup of coffee, find a sunny spot and enjoy the fruits of summer. This lemon ricotta is easy and fun to make. Fresh herbs, cinnamon or nutmeg can all be added as variations. Zest the lemons and juice until you have ¼ cup. Pour the milk and cream into a large pan over medium heat and add the lemon juice. Stir to mix thoroughly. You may already see some curds forming. Stay close and monitor the heat, stirring to prevent a skin from forming on the surface and to make sure the milk isn't sticking on the bottom (reduce heat if necessary). When you see steam rising from the pot as well as little foam bubbles forming around the edge, check the temperature. Curds will start to form rapidly. Stir gently to not break up the curds. Turn off the heat when the temperature reaches 190°F. Take the pot off the stove and allow to sit undisturbed for 10 minutes for the curds to release more whey. Line a colander with cheesecloth and gently pour the curds and whey into it. Allow to drain for about 10 minutes until the texture resembles creamy mashed potatoes. Gather the cheesecloth into a bundle and give it a gentle squeeze to strain out the remaining whey. Mix in the lemon zest and salt. The salt will help release more of the whey. Stir minimally to maintain the creamy texture.